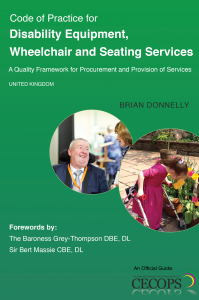 Discover everything you need to know about planning, commissioning, assessing for and providing disability equipment, wheelchair and seating services safely and effectively in this comprehensive and unique Code of Practice. To address the impending global care crisis resulting from the growing elderly population and an increase in the number of people living with long term conditions, there needs to be better deployment of the full range of disability equipment, with a clear strategy, for enabling independent living, enhancing disabled people’s employment prospects and empowering individuals to take control and manage their own care. To achieve this effectively there need to be the right structures and processes in place to ensure timely and safe provision of the right equipment and associated services, thereby improving outcomes for service users. This Code provides a template for taking these actions and following it will go a long way in achieving these aims. The Code relates mainly to disability equipment, wheelchair and seating services, and applies in every setting where these services are provided. It also applies more generally to other assistive technology related services, and provides the necessary links to these services so that holistic, integrated and person-centred care can become a reality. The Code can be used for many purposes: as a general guide, for tendering services, performance and risk management, regulatory compliance, strategic and operational purposes and much more. It puts the user at the heart of services. The Code sets a national (UK), and perhaps international, benchmark against which services can be measured, as well as a realistic level of service people should expect to receive.